Not once did I state anything remotely to the effect of "photoshop". Not once did I state you said this, only Tsassi and Celestis have. can see everything that matters at those edges to a far better degree than I will ever be able to see through opaque bits of gun in my face. Neither Celestis, or Tsassi apparently can't, they also stated "photoshop" as well, and even with the browser influences they still stated that it looked "darker" then usual, even though that's base Halo MCC. Idk where you got automatic DMR from, because the AR is far, far from being a automatic DMR due to the massive spread it has. Not only that, but it takes around 15-16 shots before you're even able to kill someone with a AR, regardless of what scope it as. In my opinion every and all scopes on a AR are just for cosmetic reasons at best, or scouting reasons even. They don't exactly affect gameplay at all in terms of the scopes. Zooming in with a AR increases it's accuracy slightly, and most people don't even use it tbh. It has been proven multiple times that despite 343s excuses, smart scope/ADS does in fact affect accuracy and range. Proven where? What 343 excuses? Zoom has always affected accuracy and range, it's been a staple of Halo since Halo 1 as far as I can tell. And the COD influences are there: ADS, (unlimited) sprint, weapon skins, sliding, clambering etc. Please research and actually think before you type. None of these are COD influences at all, what? ADS = Zoom. Same mechanic, different animation. Weapon skins are even in CSGO lol what? I'll give you sliding, but in no way is it a COD influence. Clambering is just a way to jump over walls/obstacles easier, which has existed in video games since before COD as well. Please research what you're actually talking about before making mindless claims in a thread that is about ADS and ADS only. If it is to return in Halo Infinite then hopefully there will be a setting to have classic scope on. Hopefully it is, because threads like this that complain about a animation are ridiculous at this point. Especially with the people that'll argue/defend it as if it changes the gameplay, when it doesn't. In all Halos prior to 5 the entire screen was see-through when zoomed. In H5G, the center part/borders of the screen (depending) no longer is when ADSing. That is what the red borders are meant to showcase. See through? Barely. Unless you look hard enough at the edges of these "black shade" you aren't going to be able to notice other players at all. All the red borders show case is what I've already described prior, other then also showing you have a much wider viewing angle in all cases with a far clearer advantage at the outer edges of the screen. And the other Halo's were also less then "100%"
A debate requires factual accuracy. You make false statements and are being corrected. That's not a debate. So far all I can determine with this is a person who's done the logical fallacy..Yes, what I've stated has had factual accuracy with screenshots to back it them up. So far all you've done is list out of date images, links that have contradicted what you yourself have stated prior, and blabber on. Not entirely sure what the point you were trying to make with this one, but it's clearly not working. BTW I highly recommend that you should stop trying to change the topic at hand here. Classic zoom hat 100% visibility.. According to the screenshots I've provided, none of this is 100% visibility.I guess in very brightly lit area's it provides close to 70% visibility, but no where near 100%. The correct word is actually shade, which is not 100% visibility. The Elite picture was meant to show that if you ADS while trying to shoot an enemy at medium range, I will cover 3/4 of his character model, obscuring the very thing you're trying to get a precise shot on. That's not how it works at all though, and here's a picture showing you that's not how it works at all in the slightest. Here's another one, and another one. The multiplayer picture shows that it only gets worse with increasing range, because the relative perceived size of the enemies gets smaller due to distance scaling, so at long range, it's more like ~90% being covered. It seems like quite the opposite is happening here. The further your opponent is away from you, the more they appear to be in full view of your reticle. I'm sorry it took so long, but here they are in this very response. Halopedia even disagrees with you here. W It's a close-mid range weapon, it's not meant for long ranges at all. Everything Halo has already stated it excels at mid-range engagements. Attempting to engage a target at longer ranges requires more rounds and less movement as the rounds become inaccurate over longer ranges. In close quarters combat it is fairly surpassed by the Covenant carbine, as the latter weapon is more capable of performing headshots. What? That is smart-scope. You raise your weapon to the eye to look through the scope. That's literally the definition of the mechanic. Also, Screenshot on Halopedia with the description "Smart Scope with the SRS99-S5AM in the Halo 5: Guardians Multiplayer Beta." Then by this logic, Smart scope is also a feature in Halo 1, 2, 3, 4, Reach, ODST, 4, 5 and so on as said here. The Halo 5 "smart scope" DMR is practically the closest example we got to "classic halo scopes" in Halo 5. Actually, how old even is that screenshot? Almost looks like a zoomed in version of the sentinel DMR's scope with the outer edges, but the color scheme seems to be the same as a default DMR. BTW, what made you compare it to the DMR in Reach? We aren't comparing here. I'm showing an example of the closest example we have to the classic scope functionality, not a direct comparison. This apples to all classic scoped weapons, not just a single weapon. Worst offender? I thought the H5 BR was the worst offender LOL. Now it's suddenly the DMR? Here's a up to date picture of the current Reach DMR zoom, something else I guess you aren't able to provide. Uh, what? It matters heavily because spreading misinformation about a topic will misinform other users. Beta's aren't always accurate to the full release, and in Halo 5's case, an entirely different game almost. Please stop posting misleading information. ADS changes weapon spread. Classic zoom did not. In both those videos, weapon spread is decreased and accuracy is increased when you zoom in, sorry what? I don't understand your argument here at all. In fact, in the Halo 3 video weapon spread is slightly "increased" due to the much further range, but as you can see it's barely increased at all from such a long range. You can see the exact same result in Halo 5 today. Funny enough you're also using a out of date Halo 5 beta video, once again. Where did I say it didn't change how the guns work? I quite clearly stated the Zoom mechanic has not changed, and is exactly the same as always. Different animation, Same mechanic. Every gun that used to have the Zoom function in previous Halo games, act identically in Halo 5 as well with little to no change based off how the Zoom mechanic works. 343 decided to add the zoom mechanic to the automatic weapons as well, along with any other weapon that previously didn't have a zoom mechanic. Take a shot every time I said zoom. Sprint does not allow you to move and shoot at max speed at the same time. This is a topic about ADS/Zoom mechanic, not sprinting. Take that to another topic please. Clamber prevents you from skilljumps as you have to face a wall and push a button to get on top. ADSing in mid-air has you hover in place..
As I already said though, this is a topic about ADS/Zoom, not any of this other nonsense. Which played nothing like the original games. Jesus Christ, the Halo CE playlist even had sprint. How do you actually believe what you're saying? The Halo 1, 2, and 3 classic playlist in Halo 5 play a lot like the original Halo games, except for the Halo 3 one as it played a bit to much like Halo 2 on Halo 3 maps due to hitscan vs projectile. Zoom mechanic and everything else is, like I already stated, exactly the same and a different animation. That's just the zoom factor and has nothing to do with the topic at hand. By that line of thought any and all games that have a 2x zoom factor would have the same shooting mechanics as (classic) Halo. LOL WHAT That screenshot has everything to deal with this topic. What are you even on about now? The shooting mechanics remain unchanged, ADS hasn't changed a thing at all about how the guns shoot nor how they work. Adding the Zoom mechanic to close ranged weapons does not change the shooting mechanics at all, you're just adding the Zoom mechanic (and all of it's effects) to more weapons. Nothing more. Are you drunk? That video shows the exact same spread for zoomed and unzoomed. I think the only person here who is drunk is you at this point. No, it does not show the exact same spread for zoomed, and unzoomed. You can even tell the "spread" is decreased and accuracy is increased just by comparing the spread of the bullets from zoomed, to unzoomed for god sakes. It's really just that noticeable that even amateurs notice it. Data miners have already looked though the code of Halo 1, 2 and 3 and there is nothing in there that would make different spread for zoom even possible. Please show me these supposed "data miners" as everything points to you being more accurate when zooming in, in practically all the Halo games. Those same data miners you just started talking about even quite clearly state that when zoomed in, you are more accurate with a Sniper rifle in Halo 1 then you are when not zoomed in. Same goes for the Pistol in Halo 1 as well. This method has applied to all future Halo games, all the way to Halo 5. The only franchise who I see to have managed to literally come back from the dead was DOOM. DOOM has already made 2 attempts to come back, remember Doom 3? Terrible. Remember the Doom movie? Just bad. Doom (2016) was a gamble at best, it's campaign was well praised but it's multiplayer quickly died off (you can't even find games half the time on PC anymore). This is off topic though, and isn't about ADS at all anymore. So I'd just not talk about it after this point. Overwatch is FAR from a military FPS and it is EASILY the biggest, most popular FPS game on the market today. Over watch is by far the biggest or most popular FPS game on the market at the moment, far from it actually. PUBG would be the most popular "military fps shooter" on the market today. I say military because it has very military gameplay-like mechanics in it. Overwatch on the other hand, while it is still pulling a "healthy amount" of players, it's no where near being the most popular at all. Even Halo 5 still manages to pull in more players on Microsoft's "most played games" for the Xbox One, with COD4 being in 2nd place because well, it's the newest COD title. Anyways, we're getting far to off-topic at this point as it so, so I'd stay away from topics like this over-all imo. Ignoring everything else you said (some of which I disagree on) Halo 3 did not release during the time where military shooters were widely successful. Halo 3 released right when military shooters essentially started gaining popularity, not during military shooters hay day. Military shooters hay day started in 2009, some may argue 2008 with COD WAW but in my opinion it's 2009 with MW2's release date, all the way into 2014 when they started dieing off. Halo 3 released during a time of practically no competition on the xbox 360. No other game was like it, and your only other option was COD MW1, which actually ended up selling more then Halo 3 anyways. This is to off topic from the original point, so if you want to discuss this stuff just go create a thread in the off-topic section instead. Or if you're really interested, send me a message even. So then what were you bothering me about it for? Moreover the comment I was responding to didn't make any sense to begin with seeing as I felt my "vague and incoherent" statement was pretty straightforward. I had zero trouble seeing through the zoomed edges of any game except Halo 4(which I made note of), in all of your original screenshots. Your claims that OG zoom offer inferior overall visibility compared to Halo 5 ads is just objectively false unless I have far above average eyesight, play on ridiculously bright settings, or I am just a liar. There just are not any alternatives. All they noted is that is was darker than usual and were trying to theorize as to why that might be the case and photoshop is indeed a possible cause hypothetically speaking. It gets mentioned once and they move on. No one is accusing you of anything. Also both Tsassi and Celestis mention the fact that they can still see through the classic zoom screenshots just fine, despite seeming darker than usual. The larger point is that even though they appear to be darker than usual, the three of us can still see everything that matters just fine which invalidates your entire visibility argument. Take the L and move on. Okay a couple of things, one ignoring MW1 with regards to the competition argument is absurd and beyond that asserting that Halo 3 had "no competition" during or prior to its release is just inaccurate, but I digress. And two If you honestly think the post is so off topic why on Earth would you quote me and bring it back up again and worse yet participate in said discussion? More importantly seeing as you are neither the OP nor a monitor I don't think its any of your business to regulate the discussion. If I am out of line, then or now I expect the mods will set me straight. Edit the video highlightning the angle in which the bullets land. Because I don't recall there being a significant / visible difference in spread between zoomed / unzoomed. PS: you ask for proof from the data miners, but don't bother posting proof on your own findings regarding what the data miners have said? You are putting words to our mouths. I haven't at any point even mentioned "photoshop", or anything about image manipulation myself apart from my own testing when I was trying to figure out what causes the images to look darker than the source material. All Celestis said was "I don't know if they're photoshopped or not", which was before we fully understood what was going on. Now we know that it's all up to image settings in the various pieces of software and hardware we use, all the way from the game itself to the display which projects the image into our eyes. At this point we know that this is generally false. If you have trouble seeing other players through the mildly shaded area of the zoom in Halo 3 when in the game, then you are playing with suboptimal image settings. I will try and see if I can produce a test image that would allow us to better calibrate what we're seeing so that we can have a better discussion. EDIT: Okay, take this Halo 3 screenshot of the in-game brightness level 6 as our reference image. With appropriate image settings, you should be able to see every relevant part of the picture clearly, even the vines against the structure left to the frag grenade counter. Now, consider this picture. In it, I have written even numbers from 2 to 30. There's also a 1 hidden in there. If your image settings are such that you see the Halo 3 screenshot as I do, you should be able to see all numbers down to 4 at a glance, looking straight at the picture from a normal viewing distance. You don't need to be able to see the 2 and the 1 at a glance, but they should be barely visible if you look closely. If you can't see the 4 without focusing or moving your head closer to the screen, your image is too dark. NOTE: This is not a guide to proper image calibration, and is not expected to produce ideal black levels (though it's based on black level calibration patterns, and should get you reasonably close). Its purpose is simply to establish a baseline that allows us to better understand what everyone is seeing. I'd be interested to hear how far down everyone sees with their present image settings. Crouching and zooming reduces the spread a lot. Scopes have different ranges as well. The Sentinel scope has 2 zoom levels and is the scope with the most range. The COG scope tracks your opponent's shield and health. Some are cosmetic, like the Morph, but you may feel more comfortable with A instead of B. No. Zoom has never affected accuracy until Reach. It did affect Red Reticule Range (the distance were autoaim kicks in) but not the distance up to which the bullets fly or the paths they would travel. Besides the fact that ADS adds spread buffs to all weapons across the board, the point that there is a different animation alone already makes it a different mechanic, because it reduces visibility. Especially with the people that'll argue/defend it as if it changes the gameplay, when it doesn't. It factually does by changing spread. Having played every single Halo since close to two decades by now, I have never missed an enemy (singleplayer and multiplayer) that appeared in the shaded area. Scopes that shove an opaque weapons outline onto the screen do not give you a wider viewing angle compared to a transparent screen. So far all I can determine with this is a person who's done the logical fallacy..Yes, what I've stated has had factual accuracy with screenshots to back it them up. Your screenshots show classic zoom being transparent and ADS being opaque. You claim the opposite. That is not factual accuracy. That is case of denying reality. That is 100% visibility. It's not 100% brightness, contrast or saturation, but that's not the point of this discussion. You either do not know what these words mean and are thus confusing them or you do in which case you're deliberately misusing them to suit your own agenda. The Elite in that picture is 252 pixels in height, his head measures 39 pixels. The distance between the center of the crosshair and the top of the pistols model has 34 pixels still visible. Let's say you're a bad shot and aim for the chin of the elite instead of his head. In that case, 39+34=73 pixels of said elite would be visible, which makes 179 / 252 = 71% of the enemy you're trying to shoot at completely obscured from the weapon you're trying to shoot him with. And that's a lower limit. If you go for center headshots, it's 78% (39/2=20, 20+34=54, 252-54=198, 198/252=78.57%) Guess I was correct with 3/4 after all. Just for reference, this is what it looks like if you actually try to headshot that elite. Attempting to engage a target at longer ranges requires more rounds and less movement as the rounds become inaccurate over longer ranges. In close quarters combat it is fairly surpassed by the Covenant carbine, as the latter weapon is more capable of performing headshots. I love it how you elegantly deleted the part that directly contradicts you: "effective at long range against light or unshielded targets"
That article refers to "smart-link" whis is not the same thing as "smart-scope". In classic zoom, the weapon would project a live feed of a built-in camera onto the HUD. You were viewing your target from the PoV of the weapon itself. There was no need to raise the weapon to aim manually. Smart-scope takes the information provided by the gun and adds it to the spartans own field of view. 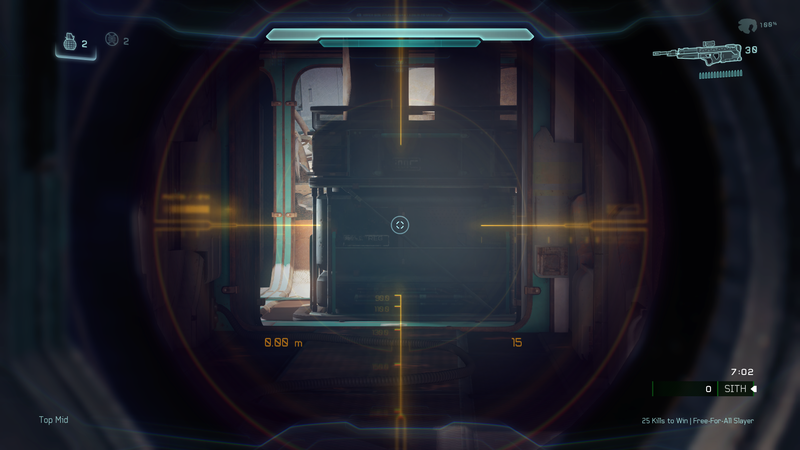 In Smart-Scope, you're viewing the target from the PoV of the Spartan with a holographic overlay. Spartans still need to raise their weapons to eye-level to aim with these overlays. As in, "aim down sights". It's the same difference as between Oculus Rift and Microsoft HoloLens. Smart-link was indeed in all games. Smart-scope is only in H5G. Your own source even explains that: "Smart-linking acts as the fictional basis for the new "smart scope" Spartan ability in Halo 5: Guardians". It's based on smart-link, just like classic zoom was, but that does not make it the same thing. According to GIMP, 931694 out of 2070601 total pixels are completely black. Not shaded, not a different brightness, but black. Painted over. No background features discernible. That makes 45% of the entire picture completely opaque. Here's a screenshot of the Reach DMR zoom: There are seven banshees clearly visible in the shaded area around the reticule. You can see their number, you can see their orientation, where they're flying, their distance to you (based on their perceived size) and you could even see if they were boosting or not (none of which is in this picture) after only one glance. In ADS you coulde only see four because the rest would be covered by an opaque weapon outline. This is not "the closest example we got to classic halo scopes" because classic scopes were 100% visible. As a matter of fact, the ADS animation of the H5G pistol, provided by your screenshot, covers only 129686 out of 2070601 pixels, or 6.26%, thereby being closer to classic zoom than the H5G DMR. BTW, what made you compare it to the DMR in Reach? I am showing you that classic zoom was transparent and ADS is not by providing "before/after" pictures. Well, you certainly aren't because it would mean having direct evidence that you're wrong. Did I ever say that? Are you sure you're not confusing me with another user? Regardless, one covers up the area on the edges, the other dead center in the middle of the screen. They're both bad, the difference is just in what way specifically. It's like choosing between pest and cholera. So you cannot make any backwards skilljumps. That just proves my point. As I already said, then don't bring it up. Movement and shooting were nothing like in the original games, both visually and mechanically. Halo CE Pistol spread unscoped vs scoped. Halo 2 BR spread unscoped vs scoped. Halo 3 BR spread unscoped vs scoped. Halo 3's wall decals disappear fairly quickly so I had to zoom in with a sniper instead of having both of them directly next to each other on the wall. But if you require it, here's a side-by-side comparison. This post on Bungie.net gave me the values to look for: Minimum Spread: 0.002617994, Maximum Spread: 0.008726646, presumably the angle in radians, since these numbers translate to 0.15° and 0.50° respectively, with a precision up to the 7th decimal point. I found both of these values labeled as "spawn offset" within the BRs properties. There is no other value labeled "spawn offset (zoom)" or anything similar, nor are there variables with similar values that would give you a reduced spread. I know these variables are the correct ones, because the "spawn offset" has the correct spread values for other weapons as well, here the AR for example. There is no other place in the code where such values are listed, at least within the original trilogy and as far as currently known. If you still insist that there are, then look at the data files yourself and provide the location where this supposedly happens. Bottom Line: There is no reduced weapon spread when zoomed in Halo 3. Same as CE and 2. It can't. There is nothing in the code that would allow for that. Now can we please, please let this misconception of spread changes in classic zoom finally die? EDIT: For whatever reason Picload decided to delete all my pictures. I have now reuploaded them to Tinypic, so for everybody who tried to access them and it didn't work, it should be fixed now. Now, consider this picture. In it, I have written even numbers from 2 to 30. There's also a 1 hidden in there. If your image settings are such that you see the Halo 3 screenshot as I do, you should be able to see all numbers down to 4 at a glance, looking straight at the picture from a normal viewing distance. You don't need to be able to see the 2 and the 1 at a glance, but they should be barely visible if you look closely. If you can't see the 4 without focusing or moving your head closer to the screen, your image is too dark. Just to weigh in on this, I can see the 4 without issues as well. I cannot see the 2 nor the 1 on my laptop screen, but I can see both of them on my TV screen, copying the file onto USB and then displaying it via XBone. Why do you want SmartLink to return as opposed to the Classic Scope? I apologize if I missed this answer as there's quite a bit to read through.